If you're diagnosed with a serious illness like breast cancer, what you put on your plate is probably the last thing on your mind. It shouldn't be this way though - as Erin Ross, who works with cancer patients at the Cleveland Clinic in the United States, points out, meal planning and eating well is a vital part of your breast cancer treatment plan. Dairy products are chockfull of calcium, vitamin D and protein, all of which contribute to strong, healthy bones. Some dairy products, such as kefir and yoghurt, feed your good gut bacteria and replenish your gut health as well. If you’re vegan, lactose intolerant or simply don’t like the taste of milk, opt for soy milk, rice milk or calcium-fortified orange juice instead. Tomatoes and tomato products such as tomato sauce and tomato paste are rich in vitamin C. Tomatoes also help battle the metallic taste that cancer patients get while undergoing chemotherapy, according to Carolyn Lammersfeld, a certified specialist in oncology nutrition and vice president of integrative medicine at the Cancer Treatment Centers of America. 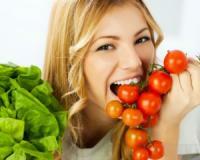 However, if you have mouth sores, you should avoid tomato products. Lean poultry like chicken and turkey may taste bland, but they’re full of protein and are easy on your digestive system. Lean meat is also a better choice than red meat as the latter can worsen inflammation and trigger other chronic illnesses like heart disease. Fatty fish like sardines, salmon and tuna are brimming with fatigue-fighting protein. They’re also stellar sources of omega-3 fatty acids, which promote strong muscles, vitamin B12, which is essential for producing red blood cells, and vitamin D, a key nutrient for bone health. If one of your friend or family members is facing breast cancer and you’re wondering how you can help, take over a meal starring one of these foods.